Ever want a chic room but you’re turned off by most of the gaudy designs? Luckily, there are ways to decorate the home stylishly without going for the large chandeliers and bejewelled headboards. Check out some of the styling tricks any of us can do to glam the home up! Vintage items can dress up a place nicely due to its timelessness and classy-feel. 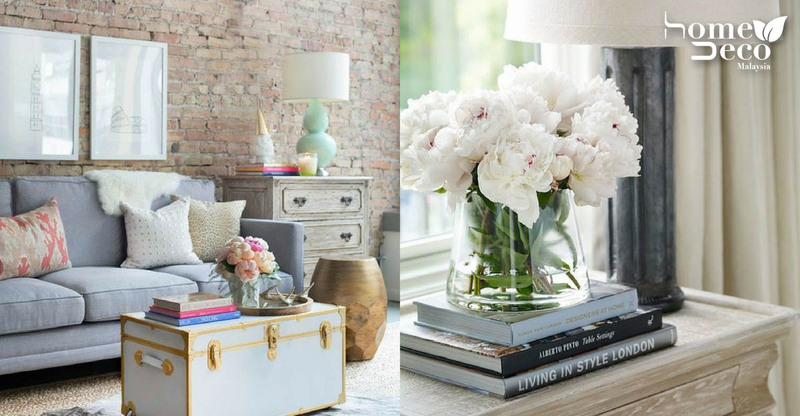 A vintage chest can double as a coffee table and be given ‘life’ a little with a vase of flowers as the centrepiece. Other decor items include books, a tray to hold the TV remote or coasters for drinks. You can even keep it bare! A vignette is grouping a number of small items in a stylish manner. To do this, you can stack books in decreasing size and top it off with a reed diffuser for the table at the entrance. Then, pair it up with a vase of flowers and add a tray to hold your house and car keys. Another way to style up corners to look chic is to mix your metals. Mixing metals creates a stylish display and it can be done by pairing a lovely vase of flowers, candle and a book with a silver lamp on a glass-topped brass table. Our white walls are perfect frames or canvas for home decor. A minimalistic decor look can be achieved by stacking books to make some plant stands or even a side desk in the living room. It’s another secret to collect more books! Colour coding books may sound like a chore but it helps create a visually pleasing space with a decorative element! It’ll look great if you plan to start a mini library and fill a whole wall of shelves with books. The shelves can still be styled up with bookends or other decorative items too. 5 Simple Lines And Shapes To Give Life To Old Pillowcases!